Today I rushed to the mailbox and tore into my first pair of Vibram Five Fingers, a pair of Flows which the manufacturer describes as being for colder temperatures. I’m very psyched for the flexibility they will give me for winter running. My first impression was that they were lighter than expected. The wetsuit-like upper felt pretty thin and the bottom quite flexible although a bit heavier in the heel than I expected. I couldn’t wait to haul them on my feet and so I immediately squeezed the right one on until I felt some packaging that had been stuffed inside. So, I pulled my foot out and stuck my fingers in to find nothing; my toes had hung up on the toe pockets. Hmm? I squeezed my foot back in and pushed my toes forward trying to aim for the appropriate pockets. Not so easy…to the point that I was starting to be concerned that my funky toes might be too funky for these things. I really had to work to get each toe in separatel, and even once they were in, I wasn’t sure if the fit was right. The second one was slightly easier only because I knew it could be done; it took maybe 45 seconds to get it on. I wasn’t bowled over when I started walking in them, but it took about 5 seconds of running before I was sold. It was 25 degrees out, and my initial take is that I can run in any cold conditions in these things. They are certainly warm enough, if anything my feet were a little sweaty; my guess is that for me Flows might be too warm if it’s over 40 degrees. 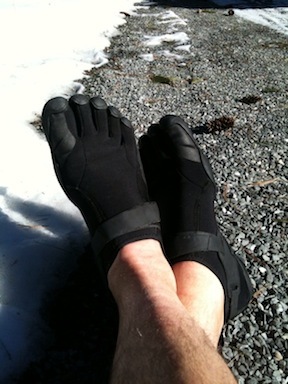 I ran on ice, snow, gravel, broken pavement and the bottoms provided plenty of protection; I really didn’t feel a thing. It was easy to maintain a barefoot stride; I don’t feel missing the sensation made it harder to run properly. On the other hand, my feet felt constrained, like wearing shoes. I can see why Barefoot Ken Bob, who loves the feeling of the wind through his toes and lives in a warm climate, is not too high on them. I walked around for a little while afterwards, and my feet felt a bit warm and damp. They came off easily; my one try at putting them back on suggested it was no easier. They pull my little toes a little laterally outward and I have some concern that for more than I few miles it could get uncomfortable. Overall, I am very pleased with the Flows. My expectation is that these will be my mainstay running shoes for sub-freezing conditions. The fit is not perfect for me, but my feet are probably not the norm. I am hoping they will go on easier over time. My friend Larry commented that he had problems with Flows that he didn’t have with other styles. I’m thinking Bikilas once they are available. All good news for Barefoot Phil! This entry was posted on February 7, 2010 at 2:33 pm and is filed under Barefoot Running, Experience. You can subscribe via RSS 2.0 feed to this post's comments.